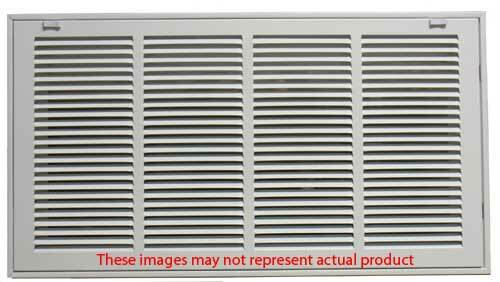 14 x 14 White Steel Return Air Filter Grill Discounts Apply ! Purchase a sturdy filter grille such as this one to provide cleaner air circulation at home. This filter grille works efficiently to provide cleaner air from duct work in the ceiling or wall. The faceplate of this filter grille easily opens by a hinge to allow you to easily change filters. Its large faceplate provides for efficient air flow from duct work. This filter grille is suitable for installation into either a sidewall or ceiling. Its sturdy frame is constructed of stamped steel and finished with a bright white finish, sealed with clear lacquer. Please note that a filter is not included with this filter grille - filter must be purchased separately to provide cleaner air from duct work. Also avilable are plain white return air grilles, available in a variety of sizes. Take a look at our washable air filters to go with your grill. They are reusable and Eco-friendly!